Spiderman is a handsome 3½-year-old black male, born in May 2001; his registration number has been double tattooed so he cannot be traced. 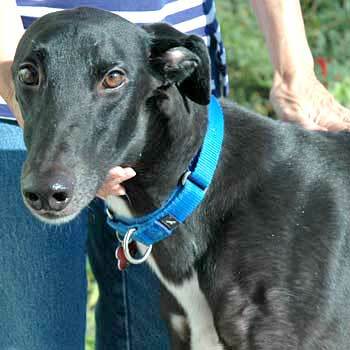 Spiderman was one of 5 male greyhounds found muzzled and abandoned in a backyard in Austin. They were all taken to a shelter in Austin, and there was a plea to take them before their kill date of July 5th, 2004. 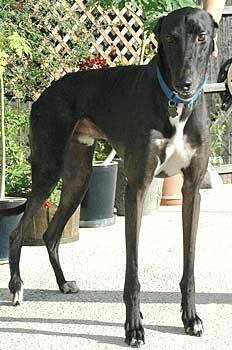 GALT took Spiderman, who was in the worst medical condition  HW positive and suffering from an old injury of a broken hock that required orthopedic surgery. You can read about his journey that has taken him full circle. he has a fear of men. He enjoys the company of other dogs, but it is not known at this time if Spiderman is small animal or cat tolerant. Spiderman is a sweet 3½-year-old male who has been through some traumatic "stuff" in his short life. And that has resulted in a real fear of men. His only inclination is to get away when he sees a man. He has been in a foster home for months and treated with nothing but love, and he still has a problem trusting the man of the house. He wants the affection, and tries to approach, but it is difficult for him. He will run as fast as he can in the opposite direction if a strange man is anywhere on the horizon. He does like being with other dogs, and does trust women. He loves the security of his crate, and spends a good part of the day in it, although he does have a comfy place to lie outside of it. He would be okay with a man in the house, but not if there wasn't a woman as the primary caregiver. He would love being in a home with other dogs as part of the family. Spiderman's surgery is healing slowly. His appetite is good, and he loves to go for a short walk every day. He still cannot run on the leg that had surgery, but he is walking normally. Spidey is beginning to learn a little about play, but it is still a new thing for him, at least with humans. He has a little fun routine about getting me up in the morning; and every once in a while, I find things he has pulled out as if to say, "Give me some attention". It seems I see his ears perking more each day. He knows life is getting better, and he is happy about that, as we all are!